Natural sources account for most of the radiation we all receive each year. The nuclear fuel cycle does not give rise to significant radiation exposure for members of the public, and even in two major nuclear accidents – Three Mile Island and Fukushima – exposure to radiation has caused no harm to the public. Radiation protection standards assume that any dose of radiation, no matter how small, involves a possible risk to human health. This deliberately conservative assumption is increasingly being questioned. Fear of radiation causes much harm. Expressed particularly in government edicts following the Fukushima accident (and also Chernobyl), it has caused much suffering and many deaths. Radiation is energy in the process of being transmitted. It may take such forms as light, or tiny particles much too small to see. Visible light, the ultra-violet light we receive from the sun, and transmission signals for TV and radio communications are all forms of radiation that are common in our daily lives. These are all generally referred to as 'non-ionizing' radiation, though at least some ultra-violet radiation is considered to be ionizing. Radiation particularly associated with nuclear medicine and the use of nuclear energy, along with X-rays, is 'ionizing' radiation, which means that the radiation has sufficient energy to interact with matter, especially the human body, and produce ions, i.e. it can eject an electron from an atom. X-rays from a high-voltage discharge were discovered in 1895, and radioactivity from the decay of particular isotopes was discovered in 1896. Many scientists then undertook study of these, and especially their medical applications. This led to the identification of different kinds of radiation from the decay of atomic nuclei, and understanding of the nature of the atom. Neutrons were identified in 1932, and in 1939 atomic fission was discovered by irradiating uranium with neutrons. This led on to harnessing the energy released by fission. Nuclear radiation arises from hundreds of different kinds of unstable atoms. While many exist in nature, the majority are created in nuclear reactionsa. Ionizing radiation which can damage living tissue is emitted as the unstable atoms (radionuclides) change ('decay') spontaneously to become different kinds of atoms. These are fast-moving electrons emitted by many radioactive elements. They are more penetrating than alpha particles, but easily shielded – the most energetic of them can be stopped by a few millimetres of wood or aluminium. They can penetrate a little way into human flesh but are generally less dangerous to people than gamma radiation. Exposure produces an effect like sunburn, but which is slower to heal. The weakest of them, such as from tritium, are stopped by skin or cellophane. Beta-radioactive substances are also safe if kept in appropriate sealed containers. These are high-energy electromagnetic waves much the same as X-rays. They are emitted in many radioactive decays and may be very penetrating, so require more substantial shielding. Gamma rays are the main hazard to people dealing with sealed radioactive materials used, for example, in industrial gauges and radiotherapy machines. Radiation dose badges are worn by workers in exposed situations to detect them and hence monitor exposure. All of us receive about 0.5-1 mSv per year of gamma radiation from rocks, and in some places, much more. Gamma activity in a substance (e.g. rock) can be measured with a scintillometer or Geiger counter. Cosmic radiation consists of very energetic particles, mostly high-energy protons, which bombard the Earth from outer space. They comprise about one-tenth of natural background exposure at sea level, and more at high altitudes. Neutrons are uncharged particles mostly released by nuclear fission (the splitting of atoms in a nuclear reactor), and hence are seldom encountered outside the core of a nuclear reactor. * Thus they are not normally a problem outside nuclear plants. Fast neutrons can be very destructive to human tissue. Neutrons are the only type of radiation which can make other, non-radioactive materials, become radioactive. * Large nuclei can fission spontaneously, since the so-called strong nuclear force holding each nucleus together is not overwhelmingly stronger than the repulsive force of charged protons. In order to quantify how much radiation we are exposed to in our daily lives and to assess potential health impacts as a result, it is necessary to establish a unit of measurement. The basic unit of radiation dose absorbed in tissue is the gray (Gy), where one gray represents the deposition of one joule of energy per kilogram of tissue. However, since neutrons and alpha particles cause more damage per gray than gamma or beta radiation, another unit, the sievert (Sv) is used in setting radiological protection standards. This weighted unit of measurement takes into account biological effects of different types of radiation and indicates the equivelent dose. One gray of beta or gamma radiation has one sievert of biological effect, one gray of alpha particles has 20 Sv effect and one gray of neutrons is equivalent to around 10 Sv (depending on their energy). Since the sievert is a relatively large value, dose to humans is normally measured in millisieverts (mSv), one-thousandth of a sievert. Note that Sv and Gy measurements are accumulated over time, whereas damage (or effect) depends on the actual dose rate, e.g. mSv per day or year, Gy per day in radiotherapy. The becquerel (Bq) is a unit or measure of actual radioactivity in material (as distinct from the radiation it emits, or the human dose from that), with reference to the number of nuclear disintegrations per second (1 Bq = 1 disintegration/sec). Quantities of radioactive material are commonly estimated by measuring the amount of intrinsic radioactivity in becquerels – one Bq of radioactive material is that amount which has an average of one disintegration per second, i.e. an activity of 1 Bq. This may be spread through a very large mass. N.B. Though the intrinsic radioactivity is the same, the radiation dose received by someone handling a kilogram of high-grade uranium ore will be much greater than for the same exposure to a kilogram of separated uranium, since the ore contains a number of short-lived decay products (see section on Radioactive Decay), while the uranium has a very long half-life. One curie was originally the activity of one gram of radium-226, and represents 3.7 x 1010 disintegrations per second (Bq). The Working Level Month (WLM) has been used as a measure of dose for exposure to radon and in particular, radon decay productsb. Since there is radioactivity in many foodstuffs, there has been a whimsical suggestion that the Banana Equivalent Dose from eating one banana be adopted for popular reference. This is about 0.0001 mSv. Radiation can arise from human activities or from natural sources. Most radiation exposure is from natural sources. These include: radioactivity in rocks and soil of the Earth's crust; radon, a radioactive gas given out by many volcanic rocks and uranium ore; and cosmic radiation. The human environment has always been radioactive and accounts for up to 85% of the annual human radiation dose. Helpful depictions of routine sources of radiation can be found on the information is beautiful and xkcd websites. Radiation arising from human activities typically accounts for up to 20% of the public's exposure every year as global average. In the USA by 2006 it averaged about half of the total. This radiation is no different from natural radiation except that it can be controlled. X-rays and other medical procedures account for most exposure from this quarter. Less than 1% of exposure is due to the fallout from past testing of nuclear weapons or the generation of electricity in nuclear, as well as coal and geothermal, power plants. Backscatter X-ray scanners being introduced for airport security will gives exposure of up to 5 microsieverts (μSv), compared with 5 μSv on a short flight and 30 μSv on a long intercontinental flight across the equator, or more at higher latitudes – by a factor of 2 or 3. Aircrew can receive up to about 5 mSv/yr from their hours in the air, while frequent flyers can score a similar incrementc. On average, nuclear power workers receive a lower annual radiation dose than flight crew, and frequent flyers in 250 hours would receive 1 mSv. The maximum annual dose allowed for radiation workers is 20 mSv/yr, though in practice, doses are usually kept well below this level. In comparison, the average dose received by the public from nuclear power is 0.0002 mSv/yr, which is of the order of 10,000 times smaller than the total yearly dose received by the public from background radiation. Naturally occurring background radiation is the main source of exposure for most people, and provides some perspective on radiation exposure from nuclear energy. Much of it comes from primordial radionuclides in the Earth’s crust, and materials from it. 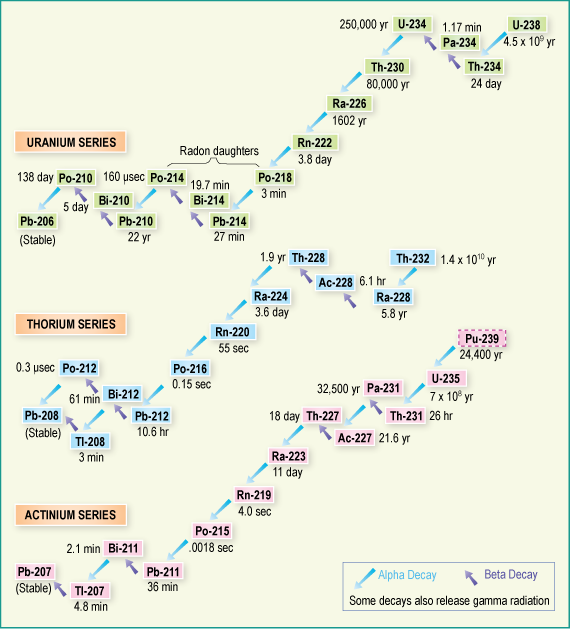 Potasssium-40, uranium-238 and thorium-232 with their decay products are the main source. Several places are known in Iran, India and Europe where natural background radiation gives an annual dose of more than 100 mSv to people and up to 260 mSv (at Ramsar in Iran, where some 200,000 people are exposed to more than 10 mSv/yr). Lifetime doses from natural radiation range up to several thousand millisievert. However, there is no evidence of increased cancers or other health problems arising from these high natural levels. The millions of nuclear workers that have been monitored closely for 50 years have no higher cancer mortality than the general population but have had up to ten times the average dose. People living in Colorado and Wyoming have twice the annual dose as those in Los Angeles, but have lower cancer rates. Misasa hot springs in western Honshu, a Japan Heritage site, attracts people due to having high levels of radium (up to 550 Bq/L), with health effects long claimed, and in a 1992 study the local residents’ cancer death rate was half the Japan average. * (Japan J.Cancer Res. 83,1-5, Jan 1992) A study on 3000 residents living in an area with 60 Bq/m3 radon (about ten times normal average) showed no health difference. Hot springs in China have levels reaching 3270 Bq/L radon-222 (Liaoning sanatorium), 2720 Bq/L (Tanghe hot spring) and 230 Bq/L (Puxzhe hot spring), though associated exposure from airborne radon are low**. ** Chinese figures from Liu & Pan in NORM VII. Radon is a naturally occurring radioactive gas resulting from the decay of uranium-238, which concentrates in enclosed spaces such as buildings and underground mines, particularly in early uranium mines where it sometimes became a significant hazard before the problem was understood and controlled by increased ventilation. Radon has decay products that are short-lived alpha emitters and deposit on surfaces in the respiratory tract during the passage of breathing air. At high radon levels, this can cause an increased risk of lung cancer, particularly for smokers. (Smoking itself has a very much greater lung cancer effect than radon.) People everywhere are typically exposed to around 0.2 mSv/yr, and often up to 3 mSv/yr, due to radon (mainly from inhalation in their homes) without apparent ill-effectd. Where deemed necessary, radon levels in buildings and mines can be controlled by ventilation, and measures can be taken in new constructions to prevent radon from entering buildings. However, radon levels of up to 3700 Bq/m3 in some dwellings at Ramsar in Iran have no evident ill-effect. Here, a study (Mortazavi et al, 2005) showed that the highest lung cancer mortality rate was where radon levels were normal, and the lowest rate was where radon concentrations in dwellings were highest. The ICRP recommends keeping workplace radon levels below 300 Bq/m3, equivalent to about 10 mSv/yr. Above this, workers should be considered as occupationally exposed, and subject to the same monitoring as nuclear industry workers. The normal indoor radon concentration ranges from 10 to 100 Bq/m3, but may naturally reach 10,000 Bq/m3, according to UNEP. US Naval Reactors’ average annual occupational exposure was 0.06 mSv per person in 2013, and no personnel have exceeded 20 mSv in any year in the 34 years to then. The average occupational exposure of each person monitored at Naval Reactors' facilities since 1958 is 1.03 mSv per year. Some of the ultraviolet (UV) radiation from the sun is considered ionizing radiation, and provides a starting point in considering its effects. Sunlight UV is important in producing vitamin D in humans, but too much exposure produces sunburn and, potentially, skin cancer. Skin tissue is damaged, and that damage to DNA may not be repaired properly, so that over time, cancer develops and may be fatal. Adaptation from repeated low exposure can decrease vulnerability. But exposure to sunlight is quite properly sought after in moderation, and not widely feared. Our knowledge of the effects of shorter-wavelength ionizing radiation from atomic nuclei derives primarily from groups of people who have received high doses. The main difference from UV radiation is that beta, gamma and X-rays can penetrate the skin. The risk associated with large doses of this ionizing radiation is relatively well established. However, the effects, and any risks associated with doses under about 200 mSv, are less obvious because of the large underlying incidence of cancer caused by other factors. Benefits of lower doses have long been recognised, though radiation protection standards assume that any dose of radiation, no matter how small, involves a possible risk to human health. However, available scientific evidence does not indicate any cancer risk or immediate effects at doses below 100 mSv per year. At low levels of exposure, the body's natural mechanisms usually repair radiation damage to DNA in cells soon after it occurs (see following section on low-level radiation). However, high-level irradiation overwhelms those repair mechanisms and is harmful. Dose rate is as important as overall dose. The UN Scientific Commission on the Effects of Atomic Radiation (UNSCEAR) currently uses the term low dose to mean absorbed levels below 100 mGy but greater than 10 mGy, and the term very low dose for any levels below 10 mGy. High absorbed dose is defined as more than about 1000 mGy. For beta and gamma radiation, these figures can be taken as mSv equivalent dose. Typical background radiation experienced by everyone (average 1.5 mSv in Australia, 3 mSv in North America). Average dose to Australian uranium miners and US nuclear industry workers, above background and medical. Typical incremental dose for aircrew in middle latitudes. Exposure by airline crew flying the New York – Tokyo polar route. Maximum actual dose to Australian uranium miners. Effective dose from abdomen & pelvis CT scan. Former routine limit for nuclear industry employees, now maximum allowable for a single year in most countries (average to be 20 mSv/yr max). It is also the dose rate which arises from natural background levels in several places in Iran, India and Europe. Allowable short-term dose for emergency workers (IAEA). Lowest annual level at which increase in cancer risk is evident (UNSCEAR). Above this, the probability of cancer occurrence (rather than the severity) is assumed to increase with dose. No harm has been demonstrated below this dose. Allowable short-term dose for emergency workers taking vital remedial actions (IAEA). Dose from four months on international space station orbiting 350 km up. Long-term safe level for public after radiological incident, measured 1 m above contaminated ground, calculated from published hourly rate x 0.6. Risk too low to justify any action below this (IAEA). 7-day provisionally safe level for public after radiological incident, measured 1 m above contaminated ground (IAEA). Allowable short-term dose for workers controlling the 2011 Fukushima accident, set as emergency limit elsewhere. Natural background level at Ramsar in Iran, with no identified health effects (Some exposures reach 700 mSv/yr). Maximum allowable annual dose in emergency situations in Japan (NRA). Criterion for relocating people after Chernobyl accident. Allowable short-term dose for emergency workers taking life-saving actions (IAEA). Tolerance dose level allowable to 1955 (assuming gamma, X-ray and beta radiation). Suggested threshold for maintaining evacuation after nuclear accident. (IAEA has 880 mSv/yr over one month as provisionally safe. Highest level of natural background radiation recorded, on a Brazilian beach. Assumed to be likely to cause a fatal cancer many years later in about 5 of every 100 persons exposed to it (i.e. if the normal incidence of fatal cancer were 25%, this dose would increase it to 30%). Highest reference level recommended by ICRP for rescue workers in emergency situation. Threshold for causing (temporary) radiation sickness (Acute Radiation Syndrome) such as nausea and decreased white blood cell count, but not death. Above this, severity of illness increases with dose. Fatal within a few weeks. The main expert body on radiation effects is the UN Scientific Commission on the Effects of Atomic Radiation (UNSCEAR), set up in 1955 and reporting to the UN General Assembly. It involves scientists from over 20 countries and publishes its findings in major reports. The UNSCEAR 2006 report dealt broadly with the Effects of Ionizing Radiation. Another valuable report, titled Low-level Radiation and its Implications for Fukushima Recovery, was published in June 2012 by the American Nuclear Society. In 2012 UNSCEAR reported to the UN General Assembly on radiation effects. It had been asked in 2007 "to clarify further the assessment of potential harm owing to chronic low-level exposures among large populations and also the attributability of health effects" to radiation exposure. It said that while some effects from high acute doses were clear, others including hereditary effects in human populations were not, and could not be attributed to exposure, and that this was especially true at low levels. "In general, increases in the incidence of health effects in populations cannot be attributed reliably to chronic exposure to radiation at levels that are typical of the global average background levels of radiation." Furthermore, multiplying very low doses by large numbers of individuals does not give a meaningful result regarding health effects. UNSCEAR also addressed uncertainties in risk estimation relating to cancer, particularly the extrapolations from high-dose to low-dose exposures and from acute to chronic and fractionated exposures. Earlier (1958) UNSCEAR data for leukaemia incidence among Hiroshima survivors suggested a threshold of about 400 mSv for harmful effects. Epidemiological studies continue on the survivors of the atomic bombing of Hiroshima and Nagasaki, involving some 76,000 people exposed at levels ranging up to more than 5,000 mSv. These have shown that radiation is the likely cause of several hundred deaths from cancer, in addition to the normal incidence found in any populationf. From this data the International Commission on Radiological Protection (ICRP) and others estimate the fatal cancer risk as 5% per sievert exposure for a population of all ages – so one person in 100 exposed to 200 mSv could be expected to develop a fatal cancer some years later. In Western countries, about a quarter of people die from cancers, with smoking, dietary factors, genetic factors and strong sunlight being among the main causes. About 40% of people are expected to develop cancer during their lifetime even in the absence of radiation exposure beyond normal background levels. Radiation is a weak carcinogen, but undue exposure can certainly increase health risks. About 60 years ago it was discovered that ionizing radiation could induce genetic mutations in fruit flies. Intensive study since then has shown that radiation can similarly induce mutations in plants and test animals. However there is no evidence of inherited genetic damage to humans from radiation, even as a result of the large doses received by atomic bomb survivors in Japan. In a plant or animal cell the material (DNA) which carries genetic information necessary to cell development, maintenance and division is the critical target for radiation. Much of the damage to DNA is repairable, but in a small proportion of cells the DNA is permanently altered. This may result in death of the cell or development of a cancer, or in the case of cells forming gonad tissue, alterations which continue as genetic changes in subsequent generations. Most such mutational changes are deleterious; very few can be expected to result in improvements. The relatively low levels of radiation allowed for members of the public and for workers in the nuclear industry are such that any increase in genetic effects due to nuclear power will be imperceptible and almost certainly non-existent. Radiation exposure levels are set so as to prevent tissue damage and minimize the risk of cancer. Experimental evidence indicates that cancers are more likely than inherited genetic damage. Some 75,000 children born of parents who survived high radiation doses at Hiroshima and Nagasaki in 1945 have been the subject of intensive examination. This study confirms that no increase in genetic abnormalities in human populations is likely as a result of even quite high doses of radiation. Similarly, no genetic effects are evident as a result of the Chernobyl accident. Life on Earth commenced and developed when the environment was certainly subject to several times as much radioactivity as it is now, so radiation is not a new phenomenon. If there is no dramatic increase in people's general radiation exposure, there is no evidence that health or genetic effects from radiation could ever become significant. Much research has been undertaken on the effects of low-level radiation. The findings have failed to support the so-called linear no-threshold (LNT) hypothesis. This theory assumes that the demonstrated relationships between radiation dose and adverse effects at high levels of exposure also applies to low levels and provides the (deliberately conservative) basis of occupational health and other radiation protection standards. The ICRP recommends that the LNT model should be assumed for the purpose of optimising radiation protection practices, but that it should not be used for estimating the health effects of exposures to small radiation doses received by large numbers of people over long periods of time. At low levels of exposure, the body's natural mechanism repairs radiation and other damage to cells soon after it occurs, and some adaptive response is stimulated which protects cells and tissues, as with exposure to other external agents at low levels. A November 2009 technical report from the Electric Power Research Institute in USA drew upon more than 200 peer-reviewed publications on effects of low-level radiation and concluded that the effects of low dose-rate radiation are different and that "the risks due to [those effects] may be over-estimated" by the linear hypothesis1. "From an epidemiological perspective, individual radiation doses of less than 100 mSv in a single exposure are too small to allow detection of any statistically significant excess cancers in the presence of naturally occurring cancers. The doses received by nuclear power plant workers fall into this category because exposure is accumulated over many years, with an average annual dose about 100 times less than 100 mSv". It quoted the US Nuclear Regulatory Commission that "since 1983, the US nuclear industry has monitored more than 100,000 radiation workers each year, and no workers have been exposed to more than 50 mSv in a year since 1989." A 2012 Massachusetts Institute of Technology study2 exposing mice to low-dose rate radiation for an extended period showed no signs of DNA damage, though a control group receiving the same dose acutely did show damage. This test on live animals confirms other work and epidemiological studies suggesting that people exposed to as much as 1000 mSv/yr at low dose rate will not suffer adverse health effects. In addition, there is evidence of beneficial effect from low-level radiation (up to about 10 mSv/yr). This 'radiation hormesis' may be due to an adaptive response by the body's cells, the same as that with other toxins at low doses. In the case of carcinogens such as ionizing radiation, the beneficial effect is seen both in lower incidence of cancer and in resistance to the effects of higher doses. This potential hormetic effect is most clearly evident in the data (see Appendix) for over 50,000 survivors of the Hiroshima bomb 1.5 to 3 km from the hypocenter, with dose range 1 to 100 mSv, compared with a large control group. Further research is underway and a debate continues, as helpfully evident in a June 2016 paper published in Biological Theory, titled Epidemiology Without Biology: False Paradigms, Unfounded Assumptions, and Specious Statistics in Radiation Science. Meanwhile standards for radiation exposure continue to be deliberately conservative. In the USA, The Low-Dose Radiation Research Act of 2015 calls for an assessment of the current status of US and international low-dose radiation research. It also directs the National Academy of Sciences to “formulate overall scientific goals for the future of low-dose radiation research in the United States” and to develop a long-term research agenda to address those goals. The Act arises from a letter from a group of health physicists who pointed out that the limited understanding of low-dose health risks impairs the nation’s decision-making capabilities, whether in responding to radiological events involving large populations such as the 2011 Fukushima accident or in areas such as the rapid increase in radiation-based medical procedures, the cleanup of radioactive contamination from legacy sites and the expansion of civilian nuclear energy. The main effect of low-level radiation arises from fear, not the radiation itself. People who are conditioned to fear any level of ionizing radiation tend to take action to avoid it, and those actions are sometimes much more harmful than any exposure to low-dose radiation could be*. Concerns about low doses of radiation from CT scans and X-rays are not only misguided, but may lead to suffering and deaths from avoided or delayed diagnosis. Also therapeutic benefits of nuclear medicine greatly outweigh any harm that might come from the controlled radiation exposure involved. * After the Chernobyl accident, some pregnant women in Europe sought abortions without any medical justification, the exposure levels being vastly below those likely to have any effects. Sometimes the fear is promoted by misguided governments, as in Japan where maintaining the evacuation of many people beyond a few weeks has resulted in over 1000 deaths, though exposure levels if people had returned to homes would not be hazardous except possibly in some limited areas, easily defined. Public dose limits for exposure from uranium mining or nuclear plants are usually set at 1 mSv/yr above background. In most countries the current maximum permissible dose to radiation workers is 20 mSv per year averaged over five years, with a maximum of 50 mSv in any one year. This is over and above background exposure, and excludes medical exposure. The value originates from the International Commission on Radiological Protection (ICRP), and is coupled with the requirement to keep exposure as low as reasonably achievable (ALARA) – taking into account social and economic factors. Radiation protection at uranium mining operations and in the rest of the nuclear fuel cycle is tightly regulated, and levels of exposure are monitored. Limiting time. In occupational situations, dose is reduced by limiting exposure time. Distance. The intensity of radiation decreases with distance from its source. Shielding. Barriers of lead, concrete or water give good protection from high levels of penetrating radiation such as gamma rays. Intensely radioactive materials are therefore often stored or handled under water, or by remote control in rooms constructed of thick concrete or lined with lead. Containment. Highly radioactive materials are confined and kept out of the workplace and environment. Nuclear reactors operate within closed systems with multiple barriers which keep the radioactive materials contained. UNEP notes: “While the release of radon in underground uranium mines makes a substantial contribution to occupational exposure on the part of the nuclear industry, the annual average effective dose to a worker in the nuclear industry overall has decreased from 4.4 mSv in the 1970s to about 1 mSv today. However, the annual average effective dose to a coal miner is still about 2.4 mSv and for other miners about 3 mSv." The mining figures are probably for underground situations. About 23 million workers worldwide are monitored for radiation exposure, and about 10 million of these are exposed to artificial sources, mostly in the medical sector where the annual dose averages 0.5 mSv. Radiation protection standards are based on the conservative assumption that the risk is directly proportional to the dose, even at the lowest levels, though there is no actual evidence of harm at low levels, below about 100 mSv as short-term dose. To the extent that cell damage is made good within a month (say), chronic dose rates up to 100 mSv per month could also be safe, but the standard assumption, called the 'linear no-threshold (LNT) hypothesis', discounts the contribution of any such thresholds and is recommended for practical radiation protection purposes only, such as setting allowable levels of radiation exposure of individuals. LNT was first accepted by the International Commission on Radiological Protection (ICRP) in 1955, when scientific knowledge of radiation effects was less, and then in 1959 by the United Nations Scientific Committee on the Effects of Atomic Radiation (UNSCEAR) as a philosophical basis for radiological protection at low doses, stating outright that “Linearity has been assumed primarily for purposes of simplicity, and there may or may not be a threshold dose”. (Above 100 mSv acute dose there is some scientific evidence for linearity in dose-effect.) From 1934 to 1955 a tolerance dose limit of 680 mSv/yr was recommended by the ICRP, and no evidence of harm from this – either cancer or genetic – had been documented. The LNT hypothesis cannot properly be used for predicting the consequences of an actual exposure to low levels of radiation and it has no proper role in low-dose risk assessment. For example, LNT suggests that, if the dose is halved from a high level where effects have been observed, there will be half the effect, and so on. This would be very misleading if applied to a large group of people exposed to trivial levels of radiation and even at levels higher than trivial it could lead to inappropriate actions to avert the doses. At Fukushima following the March 2011 accident, maintaining the evacuation beyond a few days did in fact lead to about 1100 deaths, according to the Japan Reconstruction Agencyh. Much of the evidence which has led to today's standards derives from the atomic bomb survivors in 1945, who were exposed to high doses incurred in a very short time. In setting occupational risk estimates, some allowance has been made for the body's ability to repair damage from small exposures, but for low-level radiation exposure the degree of protection from applying LNT may be misleading. At low levels of radiation exposure the dose-response relationship is unclear due to background radiation levels and natural incidence of cancer. However, the Hiroshima survivor data published in 1958 by UNSCEAR for leukaemia (see Appendix) actually shows a reduction in incidence by a factor of three in the dose range 1 to 100 mSv. The threshold for increased risk here is about 400 mSv. This is very significant in relation to concerns about radiation exposure from contaminated areas after the Chernobyl and Fukushima accidents. The International Commission on Radiological Protection (ICRP), set up in 1928, is a body of scientific experts and a respected source of guidance on radiation protection, though it is independent and not accountable to governments or the UN. Its recommendations are widely followed by national health authorities, the EU and the IAEA. It retains the LNT hypothesis as a guiding principle. The International Atomic Energy Agency (IAEA) has published international radiation protection standards since 1962. It is the only UN body with specific statutory responsibilities for radiation protection and safety. Its Safety Fundamentals are applied in basic safety standards and consequent Regulations. However, the UN Scientific Committee on the Effects of Atomic Radiation (UNSCEAR) set up in 1955 is the most authoritative source of information on ionizing radiation and its effects. In any country, radiation protection standards are set by government authorities, generally in line with recommendations by the ICRP, and coupled with the requirement to keep exposure as low as reasonably achievable (ALARA) – taking into account social and economic factors. The authority of the ICRP comes from the scientific standing of its members and the merit of its recommendations. Justification. No practice should be adopted unless its introduction produces a positive net benefit. Optimisation. All exposures should be kept as low as reasonably achievable, economic and social factors being taken into account. Limitation. The exposure of individuals should not exceed the limits recommended for the appropriate circumstances. National radiation protection standards are framed for both Occupational and Public exposure categories. These low exposure levels are achievable for normal nuclear power and medical activities, but where an accident has resulted in radioactive contamination their application has no net health benefit. There is a big difference between what is desirable in the normal planned operation of any plant, and what is tolerable for dealing with the effects of an accident. Here, restrictive dose limits will limit flexibility in managing the situation and thus their application may increase other health risks, or even result in major adverse health effects, as near Fukushima since March 2011 (see earlier endnote). The objective needs to be to minimize the risks and harm to the individual and population overall, rather than focusing on radiation in isolation. This is recognised to some extent in the occupational health limits set for cleaning up such situations: the IAEA sets 100 mSv as the allowable short-term dose for emergency workers taking vital remedial actions, and 500 mSv as allowable short-term dose for emergency workers taking life-saving actions. At Fukushima, 250 mSv was set as the allowable short-term dose for workers controlling the disabled reactors during 2011. Following NRA consideration of the Fukushima experience, as well as overseas standards and the science, 250 mSv is now the proposed allowable dose in emergency situations in Japan from April 2016. But even these levels are low, and there has been no corresponding allowance for neighbouring members of the public – ALARA was the only reference criterion regardless of its collateral effects due to prolonging the evacuation beyond a few days. The death toll and trauma from prolonged evacuation at Fukushima were clearly very much greater than the risks of elevated radiation exposure after the first few days. This led to the IAEA in May 2013 publishing allowable dose rates for members of the public living normally in affected areas, measured 1m above the contaminated ground. A level of 220 mSv/yr over a full year is "safe for everyone" providing any ingested radioactivity is safe. Shorter term, at 40 times this level, 170 mSv for one week is provisionally safe, and at four times the yearly level – 880 mSv – is provisionally safe for one month. In March 2011, soon after the Fukushima accident, the ICRP said that it “continues to recommend reference levels of 500 to 1000 mSv to avoid the occurrence of severe deterministic injuries for rescue workers involved in an emergency exposure situation.” For members of the public in such situations, it recommends “reference levels for the highest planned residual dose in the band of 20 to 100 millisieverts (mSv)”, dropping to 1 to 20 mSv/yr when the situation is under control. When making decisions on evacuations, optimization of all the health risks (not just radiation exposure) is required. Rather than ALARA, a concept of As High As Relatively Safe – AHARS – would be more appropriate in dealing with emergency or existing high exposure situations, based on scientific evidence. This would be similar to the 680 mSv Tolerance Dose allowable to 1950s (assuming gamma & beta radiation), and it would take into account the dose rate. This AHARS approach is supported by Allison (2011) and Cuttler (2012 & 2013) among others, and an AHARS level of 1000 mSv/yr or 100 mSv per month is suggested. This would also mean that most or all of the displaced residents from near the Fukushima plant could return home, without any elevated cancer risk. Another proposal is for As High as Naturally Existent – AHANE. That is, the highest naturally occurring radiation exposures in the world experienced by a large number of people without discernable negative health effects. At Ramsar in Iran, about 2000 people are exposed to at least 250 mSv/yr with no adverse effect. But in Guarapari, Brazil (pop. 73,000), Kerala, India (pop. 100,000), and Yangjiang, China (pop. 80,000) the average exposures are about 50 mSv/year, 38 mSv/year and 35 mSv/year respectively. In all cases, the residents have life expectancies at least as long as their national peers, and cancer rates slightly lower than fellow countrymen. US Navy shipyard worker data confirm the safety of 50 mSv/yr. The average annual radiation dose to employees at uranium mines (in addition to natural background) is around 2 mSv (ranging up to 10 mSv). Natural background radiation is about 2 mSv. In most mines, keeping doses to such low levels is achieved with straightforward ventilation techniques coupled with rigorously enforced procedures for hygiene. In some Canadian mines, with very high-grade ore, sophisticated means are employed to limit exposure. (See also information page on Occupational Safety in Uranium Mining.) Occupational doses in the US nuclear energy industry – conversion, enrichment, fuel fabrication and reactor operation – average less than 3 mSv/yr. Reprocessing plants in Europe and Russia treat used fuel to recover useable uranium and plutonium and separate the highly radioactive wastes. These facilities employ massive shielding to screen gamma radiation in particular. Manual operations are carried by operators behind lead glass using remote handling equipment. Interestingly, due to the substantial amounts of granite in their construction, many public buildings including Australia's Parliament House and New York Grand Central Station, would have some difficulty in getting a licence to operate if they were nuclear power stations. The death toll from the Chernobyl accident is about 56, that from misuse of radiotherapy and orphan radioisotope sources is less than 50 – half of those from deliberate therapeutic doses due to faulty equipment or procedures. The March 1979 accident at Three Mile Island nuclear power plant in the USA caused some people near the plant to receive very minor doses of radiation, well under the internationally recommended level. Subsequent scientific studies found no evidence of any harm resulting from that exposure. In 1996, some 2,100 lawsuits claiming adverse health effects from the accident were dismissed for lack of evidence. INES rating 5. Immediately after the Chernobyl nuclear power plant disaster in 1986, much larger doses were experienced. Apart from the residents of nearby Pripyat, who were evacuated within two days, some 24,000 people living within 15 km of the plant received an average of 450 mSv before they were evacuated. A total of 5200 PBq of radioactivity (iodine-131 equivalent) was released. Out of the 134 severely exposed workers and firemen, 28 of the most heavily exposed died as a result of acute radiation syndrome (ARS) within three months of the accident. Of these, 20 were from the group of 21 that had received over 6.5 Gy, seven (out of 22) had received between 4.2 and 6.4 Gy, and one (out of 50) from the group that had received 2.2-4.1 Gy.3 A further 19 died in 1987-2004 from different causes (see information page on Chernobyl Accident Appendix 2: Health Impacts). The report also links the accident to an increase in thyroid cancer in children: "During 1992-2000, in Belarus, Russia and Ukraine, about 4000 cases of thyroid cancer were diagnosed in children and adolescents (0-18 years), of which about 3000 occurred in the age group of 0-14 years. For 1152 thyroid cancer patient cases diagnosed among Chernobyl children in Belarus during 1986-2002, the survival rate is 98.8%. Eight patients died due to progression of their thyroid cancer and six children died from other causes. One patient with thyroid cancer died in Russia." There has been no increase attributable to Chernobyl in congenital abnormalities, adverse pregnancy outcomes or any other radiation-induced disease in the general population either in the contaminated areas or further afield. After the shelterf was built over the destroyed reactor at Chernobyl, a team of about 15 engineers and scientists was set up to investigate the situation inside it. Over several years they repeatedly entered the ruin, accumulating individual doses of up to 15,000 mSv. Daily dose was mostly restricted to 50 mSv, though occasionally it was many times this. None of the men developed any symptoms of radiation sickness, but they must be considered to have a considerably increased cancer risk. INES rating 7. The March 2011 accident at Fukushima Daiichi nuclear power plant in Japan released about 940 PBq (iodine-131 equivalent) of radioactive material, mostly on days 4 to 6 after the tsunami. In May 2013 UNSCEAR reported that "Radiation exposure following the nuclear accident at Fukushima Daiichi did not cause any immediate health effects. It is unlikely to be able to attribute any health effects in the future among the general public and the vast majority of workers." The only exception are the 146 emergency workers that received radiation doses of over 100 mSv during the crisis.5 Thyroid doses in children were significantly lower than from the Chernobyl accident. Some 160,000 people were evacuated as a precautionary measure, and prolonging the evacuation resulted in the deaths of about 1100 of them due to stress, and some due to disruption of medical and social welfare facilities. The highest internal radioactivity from ingestion was 12 kBq, some 1000 times less than the level causing adverse health effects at Goiania (see below). Certainly the main radiation exposure was to workers on site, and the 146 with doses over 100 mSv will be monitored closely for "potential late radiation-related health effects at an individual level." Six of them had received over 250 mSv – the limit set for emergency workers there, apparently due to inhaling iodine-131 fume early on. There were around 250 workers on site each day. INES rating 7. There was a major chemical accident at Mayak Chemical Combine (then known as Chelyabinsk-40) near Kyshtym in Russia in 1957. This plant had been built in haste in the late 1940s for military purposes. The failure of the cooling system for a tank storing many tonnes of dissolved nuclear waste resulted in an ammonium nitrate explosion with a force estimated at about 75 tonnes of TNT (310 GJ). Most of the 740-800 PBq of radioactive contamination settled out nearby and contributed to the pollution of the Techa River, but a plume containing 80 PBq of radionuclides spread hundreds of kilometres northeast. The affected area was already very polluted – the Techa River had previously received about 100 PBq of deliberately dumped waste, and Lake Karachay had received some 4000 PBq. This ‘Kyshtym accident’ killed perhaps 200 people and the radioactive plume affected thousands more as it deposited particularly Cs-127 and Sr-90. Many people received doses up to 400 mSv at relatively low dose rates from liquid wastes released into the river. This population has shown an increase in cancer rates at levels above 200 mSv. But below this level, cancer incidence falls below the LNT expectations. INES rating 6. In 1987 at Goiania6 in Brazil, a discarded radiotherapy source stolen from an abandoned hospital and broken open caused four deaths, 20 cases of radiation sickness and significant contamination of many more. The teletherapy source contained 93 grams of caesium-137 (51 TBq) encased in a shielding canister 51 mm diameter and 48 mm long made of lead and steel, with an iridium window. Various people came in contact with the source over two weeks as it was relayed to a scrapyard, and some were seriously affected. The four deaths (4-5 Sv dose) were family and employees of the scrapyard owner, and 16 others received more than 500 mSv dose. Overall 249 people were found to have significant levels of radioactive material in their bodies. In the 25 years since 1987 there have been zero cancers from radiation among those 249 people affected at Goiania, in spite of the ingestion of up to 100 MBq giving doses as high as 625 mSv/month (8 individuals had higher activity than 100 MBq internally of whom 4 died of Acute Radiation Syndrome but none of cancer). Two healthy babies were born, one to a mother among the most highly contaminated. However fear of the contamination has been the cause of severe stress and depression. In March 2012 Yukiya Amano, the Director General of IAEA, described Goiania as the best illustration of the effect of a terrorist dirty bomb – a few deaths but widespread fear and stress. INES rating 5. In March 2006 at the Institute for Radioelements (IRE) in Fleurus7 in Belgium a worker at a commercial irradiation facility received a high radiation dose of about 4.6 Sv from cobalt-60, resulting in severe health effects. INES rating 5. In August 2008 about 45 GBq of iodine-131 was released through the stack of the Institute for Radioelements (IRE) in Fleurus, Belgium. The release occurred following the transfer of liquid waste from one tank to another. INES rating 3. In June 2011 in Bulgaria, preparations for the recharging of a gamma-irradiation facility with cobalt-60 sources were being undertaken at Stamboliysky. A device already recharged with sources had been taken out, instead of an empty one due to personnel error. As a result, four workers were exposed to a powerful gamma radiation for approximately five minutes, giving them effective doses of over 1 Sv. INES rating 3. In 1962 a boy took home an unshielded cobalt-60 radiography source. Nine people suffered ARS and four of them died from it. In 1985, due to software failure and a fundamental design flaw in the Therac-25 medical irradiation device produced by Atomic Energy of Canada Limited (AECL), delivering 100 times the beta radiation dose intended, there were 3 fatalities from acute radiation syndrome, and three survivors of ARS. In March 1984 an iridium-192 source used for industrial radiography was removed from its shielded container and taken home by a worker. Some 11 people suffered from ARS, of whom eight died of ARS. In December 1990 at a clinic in Spain, at least 27 cancer patients were exposed to very high doses from an incorrectly repaired GE electron accelerator. Eleven of them died of ARS. In 1996 at a hospital in San Jose 114 people received an overdose of radiation from cobalt-60 in therapy, about half suffering from ARS, and 13 died of ARS. In Thailand in 2000 a 15.7 TBq orphan cobalt-60 source in a scrap metal yard exposed many people. Ten people were hospitalized with ARS, of whom three died. In India in April 2010 a cobalt-60 source from university equipment in a scrap metal yard exposed many people. Eight people were hospitalized with ARS, of whom one died. The health effects of exposure both to radiation and to chemical cancer-inducing agents or toxins must be considered in relation to time. There is cause for concern not only about the effects on people presently living, but also about the cumulative effects of actions today over many generations. Some radioactive materials which reach the environment decay to safe levels within days, weeks or a few years, while others continue their effect for a long time, as do most chemical cancer-inducing agents and toxins. Certainly this is true of the chemical toxicity of heavy metals such as mercury, cadmium and lead. These of course are a natural part of the human environment anyway, like radiation, but maintain their toxicity forever. The essential task for those in government and industry is to prevent excessive amounts of such toxins harming people, now or in the future. Standards are set in the light of research on environmental pathways by which people might ultimately be affected. i) A control group of 32,963 people over 3 km from the hypocenter. 273 people per million developed leukaemia. ii) 32,692 people between 2 and 3 km of the hypocenter, with estimated average exposure of about 20 mSv. 92 people per million developed leukaemia. iii) and iv) 20,113 people between 1.5 and 2 km of the hypocenter, where average doses “were greater than” 500mSv. The left data point (iii) represents calculated radiation exposure for that zone; the right (iv) represents what is thought to be more a more accurate dose, given the cohort's other radiation-induced symptoms. 398 people per million developed leukaemia. v) 8810 people between 1 and 1.5 km of the hypocenter, with estimated average exposure of about 5000 mSv. 3746 people per million developed leukaemia. vi) 1241 survivors less than 1 km from the hypocenter, where over 50,000 were killed. 12,087 people per million developed leukaemia. The latency period for leukaemia is less than six months. NB this is a log-log graph, and the green line would otherwise be straight. Range for cosmic and cosmogenic dose for sea level to high ground elevation. Range for external terrestrial radiation depends on radionuclide composition of soil and building material. Range for inhalation exposure depends on indoor accumulation of radon gas. Range for ingestion exposure depends on radionuclide composition of foods and drinking water. Prof Bernard L. Cohen, Validity of the Linear No-Threshold Theory of Radiation Carcinogenesis at Low Doses, presented at the 23rd Annual International Symposium of The Uranium Institute (now World Nuclear Association) held in London, UK in September 1998. Allison W. 2011. Risk Perception and Energy Infrastructure. Evidence submitted to UK Parliament. Commons Select Committee. Science and Technology. December 22. American Nuclear Society, Low-level Radiation and its Implications for Fukushima Recovery (57 MB), President's Special Session, June 2012. http://db.tt/GYz46cLe (14 MB). Cuttler, J.M., Commentary on Fukushima and Beneficial Effects of Low Radiation, Canadian Nuclear Society Bulletin, 34(1):27-32 (2013) also Dose-Response 10:473-479, 2012. Cuttler, J.M., Commentary on the Appropriate Radiation Level for Evacuations, Dose-Response, 10:473-479, 2012. Cuttler, J.M. & Pollycove, M, Nuclear Energy and Health: and the benefits of low-dose radiation hormesis, Dose-Response 7:52-89, 2009. Health Physics Society, 2013, Radiation and Risk: Expert Perspectives. Office of Naval Reactors, US Navy, Occupational radiation exposure from Naval Reactors’ DOE facilities, Report NT-14-3, May 2014. Mortazavi, S.M.J. 2014, The Challenging Issue of High Background Radiation, Ionizing and Non-ionizing Radiation Protection Research Centre. ICRP March 21, 2011, Fukushima Nuclear Power Plant Accident.